Gospel For Unreached (GFU) is a non-profit Christian website based in California, USA. Our mission is to spread the gospel to the unreached areas, through music and the Word, and to give everyone who seeks more opportunity to hear the word of God in more than one language. There are 2 billion web users, and 4 billion people who use mobile phones (increasingly these are web-equipped). The Web is not just another means of communication, but a hyper-medium that subsumes, links together and enhances all previous media. Jesus commissioned His disciples to “Go into all the world and preach the good news to all creation” (Mark 16:15). “And this gospel of the kingdom will be preached in the whole world as a testimony to all nations, and then the end will come” (Matthew 24:14). Come, let us join our hands and hearts to reach the lost and tell them the love of Jesus. Therefore go and make disciples to all nations…. surely I am with you always to the very end of the age. This is the unchanging commission of our Lord Jesus Christ. These are the last days of harvest and and we do not know when our Lord returns. We His disciples are using this cyber-evangelism as a means to declare the gospel. Our Ministry has a desire to reach the lost and help in anyway possible so that we can share the gospel. Currently we are sponsoring several missionaries and orphans in the rural areas of India. Also through our Education Ministry, we are helping needy students for buying books and other material at every school year. There are several different activities that are planned by our mission’s team throughout the year which give us the opportunity to witness Christ. These include Open air meeting, distribution of Biblical literature (tracts), displaying the Gospel Messages in the public benches at the Bus Stops, Street Evangelism (by displaying bible verses), Prayer station to pray for the needy in the park, beach and busy commercial areas, etc. Habakkuk 2:2 says "Write down the revelation and make it plain on tablets so that a herald may run with it." 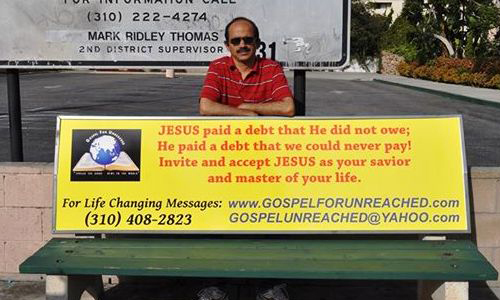 Recently Lord has given us the inspiration to do the Bench and bill board ministry. Our vision is to write all the available public benches at the bus stops with our Gospel Messages. With this ministry, we are avoiding bad advertisement from the benches and write down the Gospel messages. All the benches are taken for one year contract, after one year, if God allows we renew. Thousand of people are reading and be blessed. We need your help to fulfill this ministry. If you want to sponsor a bench for a month or for an year, please let us know.